Aces Jewel Hunt is an app game that mimics exactly the same game play as Bejeweled. It was developed by Concrete Software, Inc. and costs $0.99. The game is compatible on an iPhone, iPod Touch, and iPad. You may be thinking if you have played one matching jewel game you have played them all, and you are absolutely correct. 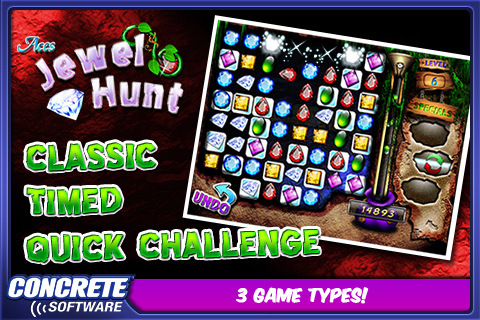 Jewel Hunt does not succeed in bringing anything new to the table as it is one of the many Bejeweled-type games. A large grid of esthetically pleasing jewels is presented to you. You are tasked with lining up three or more of the same kind of jewel to make the set of jewels disappear off of the grid as you collect them. The only function you are permitted is to switch the place of any two jewels that are non-diagonally adjacent. As your lined up jewels vanish, the laws of gravity are employed and the voided space is filled as more jewels fall from an unseen jewel heaven. Sometimes, if you are lucky enough, the jewels will fall into place and will incidentally line up in such a fashion as to create more rows and score you more points. Maybe there is a strategy here that I am missing, it is hard to be sure. Fun things happen when the magic of four or more rows disappear with only one jewel switch as you receive “specials” which are tools that have specific functions in the game. I am informed by a pop up bubble that my “special” tool that I have just earned, has the function of eliminating a row of jewels and replacing them with new ones. The jewels that you really want are the ones that are highlighted by a glowing box. Collect all of these and you will advance to the next jewel encrusted level. Challenge yourself with a variety of settings such as, a timed game or a “quick challenge” aside from the classic setting, also choose Easy, Medium, or Hard as your skills improve. Although jewel puzzle games are not for me, they do hearken back to old favorites such as Tetris, and thereby earn at least a barely tolerable place in my heart. AppSafari review of Aces Jewel Hunt was written by Vanessa Paszterko on December 29th, 2010 and categorized under App Store, Games, Puzzler. Page viewed 5253 times, 2 so far today. Need help on using these apps? Please read the Help Page. Thank you for the review. We certainly respect your opinion, though it sounds like you don’t like these types of games in general. For the people that like matching games the biggest changes are probably the specials – like the net, spear, reverse, etc. and the tumbling jewels. The specials add another layer of strategy by finding and keeping the best specials until you need them. The tumbling jewels cause much bigger “grabs” instead of just having jewels fall in from the top of the screen jewels tumble to fill in where they are missing causing more matches and more jewels to drop. Another difference is having to capture highlighted jewels. This allows you to use different strategies for high scores – do you try and stay on lower levels to score more points or move up where things get harder and jewels are worth more. I hope this helps describe what we see as the differences in Aces Jewel Hunt and other matching games.